As Israelis commemorate Memorial Day, US President Donald Trump is working to try and resolve the Palestinian-Israeli conflict, which has been ongoing since Israel was established in 1948. At the end of May, Trump is likely to visit Israel in order to advance progress on this issue. However, David Bedein, the head of the Center for Near East Policy Research, noted that a solution to the Palestinian-Israeli conflict is highly unlikely in the foreseeable future and therefore, it would be better for Trump to invest his efforts in something that is obtainable by seeking a solution for Jewish and Arab refugees from the Palestinian-Israeli conflict. From Bill Clinton to George W. Bush to Barack Obama, numerous US Presidents have sought to find a solution for the Palestinian-Israeli conflict yet failed. According to Bill Clinton, Dennis Ross and Madeleine Albright, these failures occurred due to the fact that the Palestinian leadership did not want a solution. As the saying goes, you can bring a horse to water but you can’t make it drink. Thus, one can present numerous solutions to the Palestinian side but if they are not willing to compromise on any issue of significance, there is nothing to talk about. However, the Middle East refugee crisis is a different matter. It is possible to solve that without solving the Palestinian-Israeli conflict. And by doing that, tensions between Palestinians and Israelis will be significantly reduced for much of the anti-Israel incitement in the Palestinian arena is fueled by the dire plight of the refugees, who are still living in camps instead of homes and who don’t have much of a future to look forward to. This issue is a thorn in Israel’s side, which makes peace virtually impossible. But in the future, a “settlement for the refugee problem” as envisioned in UN Security Council Resolution 242 can make it easier to solve the Palestinian-Israeli conflict, once the Palestinians got a leadership who is willing to sit down at the table and negotiate. Zionism was made to be a capital crime in Iraq. In one infamous incident, Baghdad Radio called upon Iraqis to “come enjoy the feast” as some 500,000 people paraded and danced in front of the bodies of Jews who were hanged; the mobs chanted “death to Israel” and “death to all traitors.” In June 1948, bloody riots in Oujda and Djerada killed 44 Jews, thus prompting the vast majority of the Moroccan Jewish community to leave the country. In 1947, Arab mobs devastated the Aleppo Jewish community, killing many while destroying over 200 homes, shops and synagogues. In addition, 4 Syrian Jewish girls were raped and murdered as thousands of Syrian Jews became refugees for their homes were taken over by Muslims. Between June and November 1948, bombs were set off in the Jewish Quarter of Cairo, killing more than 70 Jews and wounding nearly 200. An additional 2,000 Egyptian Jews were arrested and had their property confiscated. In 1956, the Egyptian government used the Sinai campaign as a pretext to expel 25,000 Egyptian Jews and to confiscate their property while an additional 1,000 Jews were sent to detention camps. Numerous incidents like this occurred within Jewish communities across the Arab world. As former Israel Consul General Yitzhak Ben Gad, who was expelled from Libya, related, “Our property was confiscated. Our life was in danger. If we speak about the Libyan Jewish community, we were attacked in 1945, 1948 and in 1967, all of the Jews were expelled. If we talk about refugees, there are two sides to the coin. It is impossible to talk about the Arab refugee problem without mentioning the Jewish refugee problem. The only difference between our refugees and theirs is that our country did not make us a political weapon against Arabs. We were accepted as citizens.” However, even though the Jewish refugees were accepted into Israel as equal citizens, they nevertheless lost $700 million in assets, which the Arab countries have yet to compensate them for. However, today the Palestinians are in a much worse predicament than the descendants of the Jewish refugees from the Arab world. 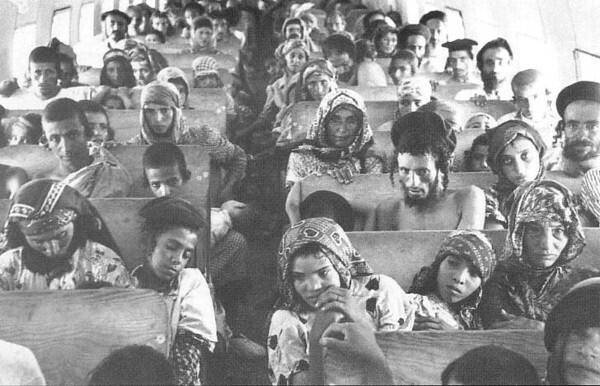 During Israel’s War of Independence, between 600,000 and 750,000 Arab Palestinians became refugees. The Palestinians lost $450 million worth of assets as well. Yet to this day, the descendants of these people have not been absorbed into a new nation state. At the same time, no country has offered the descendants of these Palestinian refugees citizenship except for Jordan. What is the solution to the Middle East refugee crisis? According to Bedein, the US provides 33 percent of UNRWA’s budget and thus can dramatically influence how they operate. So far, the American aid continues even though Hamas controls UNRWA’s workers and teachers union. In fact, the relationship between UNRWA and Hamas is so strong that Bedein even filmed Hamas terrorists praising their cooperation with the international organization. According to him, UNRWA plays a major role in ensuring that the conflict is not resolved. So how can the US solve this problem? Ben Gad claimed that they should simply make sure UNRWA no longer exists or at the very least, change how they operate. According to Bedein, “The new Trump Administration could demand that UNRWA dismiss all employees affiliated with Hamas in accordance with laws in the US, Canada, the EU, the UK and Australia, which forbid aid to agencies that employ members of a terrorist organization. The US could ask that paramilitary training of UNRWA students be brought to an end. It could also demand to audit donor funds that flow to UNRWA from 68 countries and examine reports of wasted resources, duplicity of services and the illegal flow of cash to terrorist groups. At the same time, President Trump could finally push UNRWA to adopt Office of the United Nations High Commissioner for Refugees (UNHCR) principles and direct UNRWA to engage in permanent resettlement of Arab refugees from the 1948 war.” Thus, if Trump forces UNRWA to change and compels the Arab states to properly absorb the descendants of Palestinian refugees, the conflict will die down. If the descendants of both Jewish and Arab refugees are compensated via a special fund that Clinton was willing to establish, the Middle East refugee crisis will be over.